BE PART OF THE EVOLUTION OF TEACHING CLASSICAL HATHA YOGA WITH GREATER INTEGRITY ! One of the great benefits of a well-designed yoga practice is that it helps restore functional tension, balance and healthy postural patterns. Our chronic sitting patterns along with excessive use of digital devices has led to a global epidemic of tension imbalances in our population. International Yoga presenter and exercise science specialist Kreg Weiss from Montreal returns to Dubai to present an uplifting 100 hour integrative program teaching you the fundamentals of how to confidently create CLASSICAL HATHA YOGA PRACTICES that weave in the intelligence and integrity of western science with the harmonious elements of traditional Hatha Yoga. You'll be encouraged to go deeper into the biomechanics of yoga poses for fluid transitions, how to correct, modify, assist, design and sequence multiple uplifting Hatha Yoga flows for various clientele and demographics including beginners, mixed-levels, intermediate, athletes and corporates. This training is an EXCELLENT foundation for yogis who may be keen to enroll into a 200hr at a later stage and for active teachers of all styles wishing to expand their clientele base and learn how to teach Classical Hatha Yoga sequences with the integrity of Western Science. *This training also counts as 100hr CEC for Yoga Alliance Registered Teachers. 6 complete, days of learning how to design and sequence flows effectively and functionally for various clientele and demographics including beginners, mixed-levels, intermediate, athletes, and corporates. The 100 hour training covers 77 contact hours and 23 hours of private in-home study/exercises before and during the course. Kreg acquired his yoga certification in 2002 following several successful years of venturing in the wellness industry as a personal trainer and group fitness trainer. As a national competitive Sport Aerobics athlete, Kreg won several titles including National Champion in 1999 and has been able to complement his athletic background and teaching practice with intensivestudies in Kinesiology and Health Sciences at the University of British Columbia. At UBC, he was awarded Top Honors in Exercise Science upon graduating. 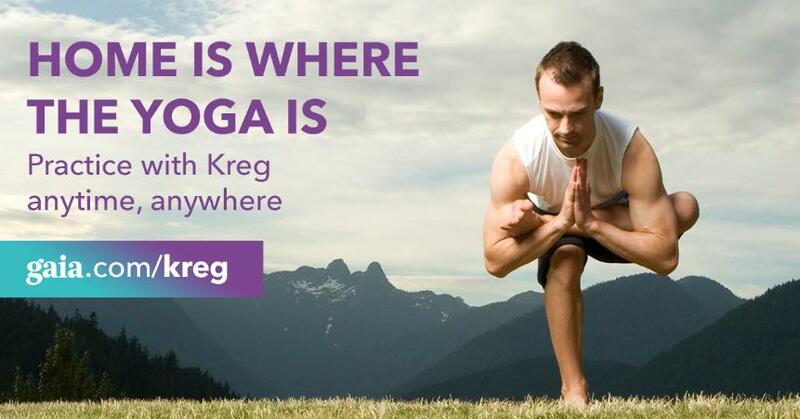 Striving to share his passion for yoga, Kreg was inspired in 2004 to co-create MyYogaOnline.com, which grew to become a thriving production company and the leading global resource for online yoga videos. 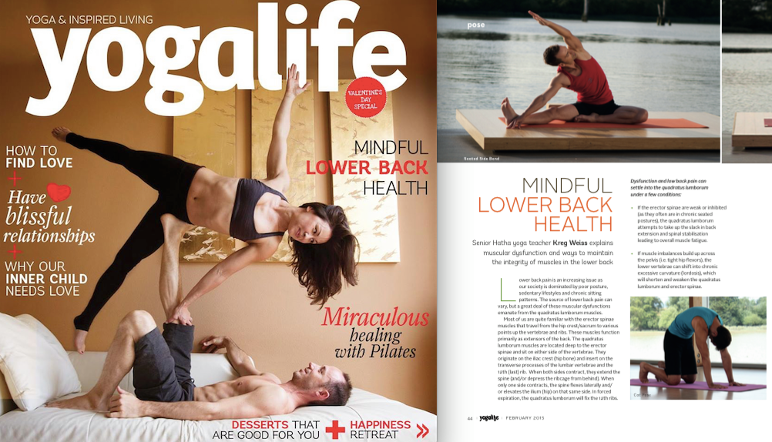 MyYogaOnline.com is now part of Gaia.com where you can find a large number of Kreg’s online practices. With his extensive background in anatomy and physiology, Kreg feels privileged to be able to empower students and other teachers with practices that are educational, engaging and accessible. 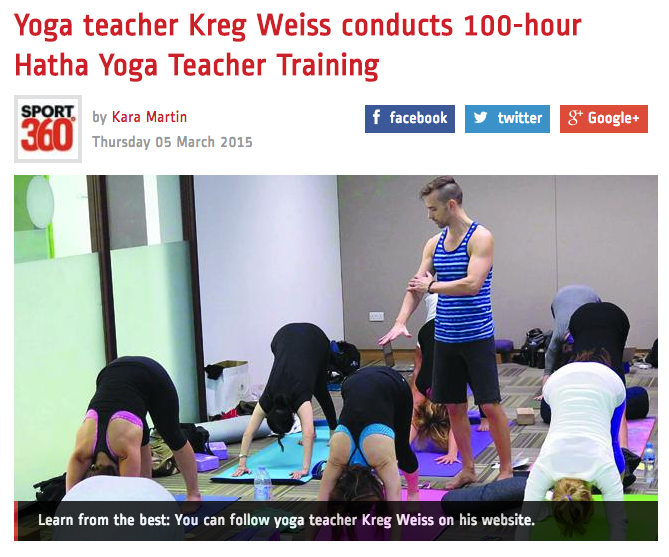 Through integrity-driven classes, Kreg aims to provide students and teachers with the tools to pursue a unique, confident practice where asanas, pranayama, and meditation interact collectively to rejuvenate and heal the body and mind. "I’ve often been told that yoga is for everyone. As an aspiring teacher who’s beginning her own journey, I wondered about the accuracy of that statement, and the depth of knowledge necessary to assimilate students into a practice that was safe and right for each of them. I found, and began following Kreg Weiss' videos after I injured myself. I ached for practical advice about the biomechanics of my own body, relative to my yoga practice. Thanks to the positive buzz about workshops Noura has facilitated, once Kreg’s training was announced, I knew I had to be there. He did not disappoint. He teaches with the same passion and vigor that initially captivated me in his videos. The information at first glance appears dense and complex, but he breaks down all facets of his seminar with meticulously crafted presentations that are chocked full of well-labeled diagrams, and his own personal notes to guide you through each discussion. He injects humor and humility into every aspect of his training program. It is like having coffee with a friend; the crazy good kind of friend, that overflows with so much love for what they do, that their passion pours through them whenever they talk about it...you can’t help but to follow their lead. Kreg also made it a point to make himself available for discussions, individual guidance and post-seminar Q&A. At some point in the training, we discussed meditation and finding that stillness in between everything that creates static in our lives. I find that idea applicable to what I’ve learned in his seminar. We covered many aspects ‘between’: the bones, spirituality and practicality, flows for mixed level abilities and posture levels conducive to different anatomical variations. A primary benefit for Downward Facing Dog pose is the stretch that is delivered to the hamstrings. When we understand that the hamstrings anatomically lie in an outer track and inner track, we can make a subtle spiraling adjustment to enhance this desired benefit. Need a place to stay during the training within 12 minute walking distance? Please let us know upon submitting interest and we will help you out! You will spot Carrefour, Biorganics shop, Taqado and NAR restaurant on the ground level. PLEASE NOTE THAT ALL FEES ONCE PAID WILL NOT BE REFUNDED OR ADJUSTABLE UNDER ANY CIRCUMSTANCES. WE UNDERSTAND THAT EMERGENCIES AND OTHER LIFE SITUATIONS DO ARISE. WE RECOMMEND THAT YOU CAREFULLY REVIEW YOUR SCHEDULE AND UPCOMING OBLIGATIONS TO ENSURE THAT YOU CAN COMMIT FULLY TO THE COURSE. IF UNFORESEEN CIRCUMSTANCES OCCUR AND THE COURSE IS CANCELLED, THE FULL REGISTRATION FEE WILL BE REIMBURSED, BUT WE WILL NOT BE RESPONSIBLE FOR ANY OTHER CHARGES INCURRED BY THE PARTICIPANT, INCLUDING HOTEL & AIRLINE FEES.